Being biological tissue in nature, facial biometric trait undergoes ageing. Previous studies indicate that ageing has profound effects on face biometrics as it causes change in shape and texture. Despite the rising attention to facial ageing, longitudinal study of face recognition remains an under-studied problem in comparison to facial variations due to pose, illumination and expression changes. A commonly adopted solution in the state-of-the-art is the virtual template synthesis for ageing and de-ageing transformations involving complex 3D modelling techniques. However, these schemes are prone to estimation errors in the synthesis. Another promising solution is to continuously adapt the enrolled templates to the temporal variation (ageing) of the input samples based on some learning methodology. Although efficacy of template update procedures has been proven for expression, lightning and pose variations, the use of template update for facial ageing has been mainly overlooked till date. To this aim, the contributions of this chapter are (a) evaluation of six baseline facial representations, based on local features, under the ageing effect, (b) analysis of the compound effect of ageing with other variates, i.e. race, gender, glasses, facial hair etc., (c) introducing template ageing as a concept drift problem, and (d) investigating the use of template update procedures for temporal variance due to the facial ageing process. 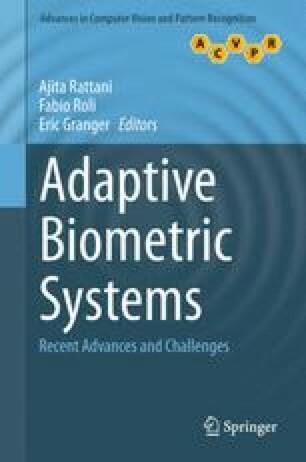 The authors would like to thank Dr. Ajita Rattani of the Department of Computer Science and Engineering, Michigan State University (USA) for her valuable suggestions.